We specialise in producing high quality beef, lamb, hogget, and mutton from our rare and traditional British breeds of livestock. grassland. We support the principles of organic farming, though we have never applied for organic status. 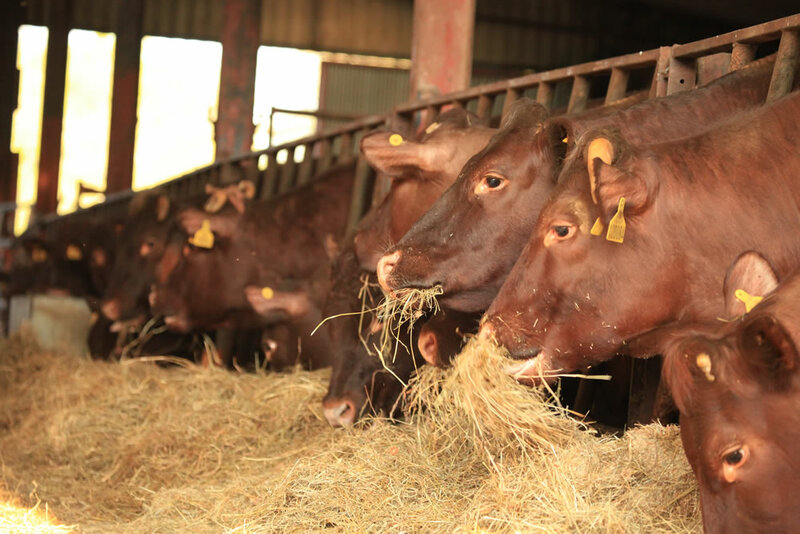 We manage our land and our livestock for sustainable productivity and conservation of wildlife and the environment. Our main fertiliser is farm yard manure, and weeds are controlled as far as possible by cutting, topping and spot spraying. 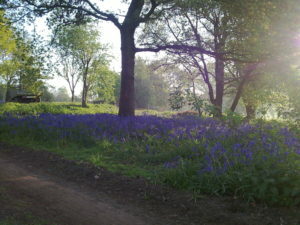 which receives minimal interference and is a haven for wildlife of all sorts. The logs for our wood-burning stoves are supplied from the managed timber. The large lake at the centre of the farm was created when Reggie Mason built a dam across the brook in 1935. 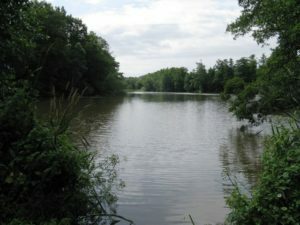 Around the farm there are numerous smaller ponds, most the site of ancient clay pits. Our farm buildings include a mediaeval barn, which is unusual in retaining its original crown posts in the roof. 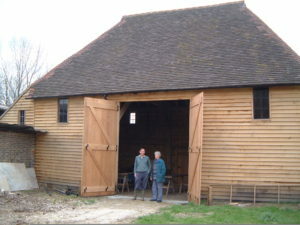 We restored it in 2002 with the help of a grant from the Countryside Stewardship scheme. Our farm was brought into the family by Reggie Mason in the 1920s. and is now farmed by Pat Garratt (grand-daughter) and Bridget Stevenson (great grand-daughter). We have bred pedigree Dexters since 1978. Sussex cattle were bred here in the 1940s, when Clare Bowyer (daughter of Reggie Mason) was one of only two ladies breeding Sussex cattle. We reintroduced them in 2008 and our first pure bred Sussex calves were born in 2011. We introduced our pedigree Portlands in 2000. 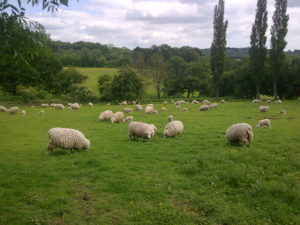 Our main flock consists of Romneys, which were introduced in 2007 by the purchase of 60 ewes and 40 yearling ewe lambs. A proportion of these are bred pure, while others are crossed with a Charollais, Texel or Suffolk rams for extra growth. 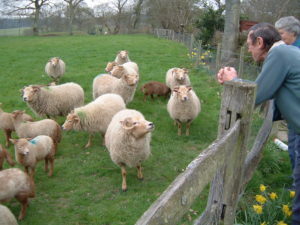 We also have a flock of Charollais sheep for producing breeding and terminal sires. We also have a friendly DIY Livery with boxes for 17 horses, a sand school, summer and winter turnouts and facilities for customer only Toll Rides. Our boxes of Dexter beef are normally available at intervals of about three weeks. However it is best to give a minimum of seven weeks' notice, and we are usually taking orders up to three months in advance. Most of our Dexter beef is booked up well in advance, but you can always ask! Lamb or hogget is generally available throughout the year. Between October and April about 4 weeks notice is normally sufficient. From April to August it is safest to order by the end of March to make sure that we keep sufficient hoggets to meet the demand from our private customers. Mutton is normally available throughout the year at about a months notice. Sheep meat We sell our lamb, hogget and mutton by the whole or half carcass. Email a request for our customer choice to see what cuts are available. We care deeply about our livestock, our land, and the wildlife it attracts. You can buy delicious beef and lamb direct from the farm from our home bred traditional breeds of cattle and sheep. One of many comments from our satisfied local customers from many local towns and villages including Ardingly, Burgess Hill, Cuckfield, East Grinstead, Lewes, Uckfield. Have you seen the Local Food Sussex website www.localfoodsussex.com Here you can find information about other local producers and suppliers of food and drink, as well as caterers and places to eat. We are pleased to be approved members of this site.